January 2007 -- Links International Journal of Socialist Renewal -- In recent years there have been a number of cases where revolutionary Marxist parties have initiated or participated in attempts at building broad socialist parties. Examples include the Scottish Socialist Party; the Socialist Alliance and later Respect in England; the Socialist Alliance in Australia; Papernas in Indonesia; participation in the Party of Communist Refoundation in Italy; and the New Anti-Capitalist Party initiated by the Revolutionary Communist League (Ligue Communiste Revolutionnaire) in France. Sometimes Marxist groups that participate in such broad formations are accused of "liquidationism". This was a term used by Lenin to refer to the policy of certain members of the Russian Social-Democratic Labour Party who wished to dissolve ("liquidate") the RSDLP after the crushing of the 1905 revolution. Critics of the policy of building a broad left party sometimes say that, when a revolutionary Marxist group joins such a broader formation, this amounts to the liquidation of the Marxist group. Those who argue in this way claim that building a broad left party is contrary to Lenin's policy of building a revolutionary vanguard party. How valid is this counterposition? Lenin certainly aimed to build a vanguard party that could lead a revolution. But creating such a party was a long and complicated process. The RSDLP adopted a revolutionary program at its 1903 conference. However it immediately split into Bolshevik and Menshevik factions. While the split was apparently over organisational matters, it also reflected incipient political differences. Nevertheless, in subsequent years there were periods when Lenin was willing to work with the Mensheviks, or a section of them, in the framework of a united RSDLP. For example, he collaborated with the "pro-party Mensheviks" led by Georgi Plekhanov to produce a common newspaper, Zvezda, which was published between 1910 and 1912. He built the January 1912 RSDLP conference jointly with some of the pro-party Mensheviks, and all non-liquidationist trends in the party were invited. Ultimately Plekhanov backed away from the opportunity to participate in building the RSDLP together with the Bolsheviks. But many rank and file workers who had supported the Mensheviks or had been non-aligned did join Lenin in this project. Given the diversity of those invited to participate in the January 1912 RSDLP conference, it seems reasonable to say that during this period Lenin was trying to build the RSDLP as a "broad party". But at the same time, Lenin worked to ensure that the politics of the party were not watered down. The conference adopted a clear political line: the key demands which the Bolsheviks had fought for were adopted as the basis for the party's mass campaigning. Of course, this historical analogy does not prove the correctness of any particular broad left party project today. Each must be looked at on its own merits. Liquidationism may be a real danger in some cases. This article looks at Lenin's party-building approach, with a particular focus on his struggle against liquidationism. Liquidationism was a trend that arose within the Russian Social-Democratic Labour Party in the years following the defeat of the 1905 revolution. The liquidators said that the RSDLP (which was an illegal party with a revolutionary Marxist program) should be dissolved (or liquidated), and that socialists should work solely through legal organisations. Some of the liquidators advocated setting up a legal labour party. But in order to have any chance of legal recognition in the repressive climate of tsarist Russia, such a party would have needed to drop key aspects of the RSDLP’s program, including its call for the overthrow of the tsarist monarchy. Liquidationism arose within the Menshevik faction of the RSDLP. The division of the RSDLP into Bolshevik and Menshevik factions went back to the second congress of the party in 1903. The immediate cause of the formation of factions was a dispute over the composition of the editorial board of the newspaper Iskra. But there were also political issues involved. The 1903 congress adopted a program that outlined a longer term perspective of socialist revolution, but defined the "immediate political task" in Russia as being "the overthrow of the tsarist autocracy and its replacement by a republic based on a democratic constitution..." (Lenin Collected Works, vol. 6, pp. 27-28). The program also included reforms to benefit workers, including the eight-hour day, and measures aimed at "eradicating the remnants of the old serf-owning system" (LCW, vol. 6, p. 30). In 1905 there was a revolutionary upsurge in Russia. Workers carried out political strikes and formed soviets, which were city-wide councils of representatives from factories. The soviets began to play the role of an alternative government to the tsarist regime. Workers began to form their own armed self-defence groups, and in Moscow armed workers fought against the tsarist troops. There were also revolts by sailors, and the beginnings of peasant revolt. As well as using repression, the tsarist regime offered some concessions. It called elections for a sort of parliament called the Duma. However the election rules were very undemocratic, with the votes of the upper classes being worth more than those of lower classes: one landlord vote equalled three capitalist, 15 peasant or 45 worker votes. Women could not vote, and students, soldiers, agricultural workers and unskilled workers were also excluded from voting. (LCW, vol. 18, p. 622, note 89). And the parliament had little power anyway. Nevertheless, the concessions were sufficient to persuade the liberal bourgeoisie to reach an accomodation with tsarism. When it became clear that the 1905 revolution had been defeated, there was debate in the RSDLP on the implications for the party's strategy and tactics. The Bolsheviks argued that new outbreaks of rebellion could be expected sooner or later, and it was necessary to continue arguing for a democratic revolution and preparing the party to lead a new revolutionary upsurge to victory. Some Mensheviks, on the other hand, had no confidence in a new upsurge, and thought it was necessary to work within the limitations imposed by the "reformed" tsarist monarchy. They wanted to dissolve the RSDLP and work solely through legal organisations such as unions and workers' social clubs. Some of them hoped to be allowed by the tsarist regime to form a legal workers’ party. To gain legality they were prepared to water down the politics of such a party. These people were called the liquidators. However, there was a section of the Mensheviks who thought it was still necessary to maintain the RSDLP as an illegal party. These people were known as the pro-party Mensheviks. Their most prominent leader was Georgi Plekhanov. At about the same time as the liquidationist current was emerging amongst the Mensheviks, differences also arose amongst the Bolsheviks. An ultraleft current emerged that rejected the need to take advantage of the opportunities, however limited, that existed for legal work. One of the opportunities for legal work was participation in elections for the Duma. I have mentioned the undemocratic nature of the Duma. When the plans for the Duma were first announced in 1905, the Bolsheviks called for a boycott of the elections. They called for political strikes and an armed uprising to obtain real democracy. This resulted in the plans for Duma elections being abandoned for the time being. After the crushing of the uprising, the government was able to hold elections for the Duma. The RSDLP (both Bolsheviks and Mensheviks) boycotted the first Duma elections in March 1906. The Mensheviks soon decided they had made a mistake and wanted to participate in new elections called later in 1906 (after the tsarist government had dissolved the first Duma). The majority of Bolsheviks wanted to continue the boycott. As the revolutionary wave ebbed, Lenin, while remaining optimistic about the prospects for revival of the revolutionary movement, realised that this was likely to be delayed for a number of years. He concluded that it was necessary for socialists to make use of any legal opportunities, including the use of Duma election campaigns, and speeches by socialist members of the Duma, for propaganda. Some Bolsheviks disagreed. They wanted to boycott future Duma elections and to recall the RSDLP representatives who had been elected to it. They became known as "recallists" (or otzovists in Russian). This ultraleft current was also opposed to participation in legal trade unions and other legal workers organisations. Lenin advocated a combination of legal and illegal work, believing that this was the only way to maintain and strengthen the party's links with the mass of workers and peasants. Lenin referred to the ultraleftists as "liquidators on the left", because if their policies were followed socialists would be cut off from the masses and the party would decline and eventually collapse, i.e. it would be liquidated. Lenin waged a struggle within the Bolshevik faction against the ultraleftists. He eventually succeeded in persuading the vast majority of Bolsheviks that his views were correct. The hardened ultraleftists were expelled from the Bolshevik faction. They formed their own faction, which came to be known as the Vperyod group (Vperyod means forward in Russian). Lenin's tactics proved very successful in winning increased support from workers, whereas the Vperyod group remained isolated from the workers and fell apart after a few years. I mentioned earlier that some Mensheviks were opposed to the liquidators. Lenin welcomed this, and was willing to work with the pro-party Mensheviks. Zinoviev in his History of the Bolshevik Party speaks highly of Plekhanov's role during the 1907-1909 period, saying that "his voice proved a great support to the Bolsheviks...", and that his support was "extremely important in the atmosphere of that period" (Zinoviev, p. 158). At that time Lenin did not view the Bolsheviks as a party, but as a "section" (we would say a faction) of the RSDLP. While polemicising against Menshevik ideas, Lenin was willing to work with the pro-party Mensheviks in building the RSDLP. For example, Bolsheviks and pro-party Mensheviks worked together on Zvezda, a newspaper produced between December 1910 and April 1912 (LCW, vol. 17, p. 588, note 24). But over time the leading pro-party Mensheviks pulled back from participation in this project, and it became effectively a Bolshevik paper (Zinoviev, p. 168). In January 1912, the Bolsheviks took the initiative to convene a conference of the RSDLP. It was not intended to be an exclusively Bolshevik conference. Menshevik-led local party organisations participated in the preparations for the conference. Pro-party Mensheviks, Vperyodists and Leon Trotsky were amongst those invited. However, only two non-Bolsheviks came to the conference. Both of them were pro-party Mensheviks. But Plekhanov, the most prominent pro-party Menshevik, did not attend. The conference elected a new central committee, composed entirely of Bolsheviks (Tony Cliff, Lenin, vol. 1, p 312, Pluto Press, London, 1975). The conference is often said to have marked the final split between the Bolsheviks and Mensheviks. But Lenin, in the resolutions and reports he drafted for the conference, said nothing about a split with the Mensheviks in general. Rather he drew a line of division between the Russian Social-Democratic Labour Party and the liquidators. He moved a resolution declaring that the liquidators were no longer party members, saying that "the Nasha Zarya and Dyelo Zhizni group has definitely placed itself outside the party" (a reference to two magazines published by the liquidators). The resolution called on "all Party members, irrespective of tendencies and shades of opinion, to combat liquidationism, explain its great harmfulness to the cause of the emamancipation of the working class, and bend all their efforts to revive and strengthen the illegal RSDLP" (LCW, vol. 17, p. 481). Lenin still wanted to keep the door open to the pro-party Mensheviks, and anyone else who might be willing to help build a united party with the Bolsheviks. A conference resolution drafted by Lenin said that: "Everywhere in the localities without a single exception, Party work is being conducted jointly and harmoniously by the Bolsheviks and pro-Party Mensheviks, as well as by Vperyod supporters in Russia wherever there are any, and by all other Social-Democrats who recognise the need for an illegal RSDLP" (LCW, vol. 17, p. 465). The implication was that Lenin hoped this joint work would continue. Why did the Bolsheviks take this approach? Why did they project the January 1912 conference as being open to the whole RSDLP (not including the liquidators, who were deemed to be outside the party), rather than making it a conference of the Bolshevik faction alone? First, they wanted to involve broader forces than just those who identified as Bolsheviks at that time. They wanted to draw RSDLP members who might consider themselves as Mensheviks, or as non-aligned, into joint party-building work together with the Bolsheviks. Second, they wanted to show rank and file RSDLP members that the Bolsheviks were for unity, and make it as hard as possible for their opponents to blame the Bolsheviks for any split that might occur. Paul Le Blanc states that there were "a significant number of RSDLP members who favoured the combination of legal and illegal tactics, who maintained a revolutionary class struggle orientation, but were unalterably opposed to a split in the RSDLP". He quotes one such person as saying "I, like many others... am not a Bolshevik, I am not a Menshevik, I am not an Otzovist [ultraleftist], I am not a Liquidator -- I am only a social-democrat" (Paul Le Blanc, Lenin and the Bolshevik Party, Humanities Press, New Jersey, 1993, p. 178). Lenin had to relate to this sentiment. The fact that all non-liquidator elements of the RSDLP were invited to the conference showed that the Bolsheviks were not sectarian. The fact that most of those invited didn't turn up showed that they, not the Bolsheviks, were opposed to unity on a principled basis. As Lenin noted in a speech to the conference: "All have been invited and only those who refused to help the Party are absent" (LCW, vol. 41, p. 246). In effect, the invitation to attend the conference, and the invitation to participate in carrying out the decisions of the conference, were a test for the pro-party Mensheviks. Were they serious about building the party or not? Plekhanov failed this test. "Worker Social-Democrats everywhere are re-establishing integral illegal organisations of the RSDLP in the form of factory nuclei and committees, district groups, town centres, Social-Democratic groups in all kinds of legal institutions, etc." (LCW vol. 18, p. 454). It is important to note that Lenin, in offering to work in a united party with the pro-party Mensheviks, was not proposing to water down the politics of the party. The January 1912 conference adopted a clear political line. A key question was that of overthrowing the tsarist monarchy. Although the call for a democratic republic had been included in the 1903 RSDLP program, the majority of prominent Mensheviks, especially the liquidators, had in practice dropped that demand. The conference resolved that: "Propaganda for a republic, and against the policy of the tsarist monarchy, must be given special prominence to counteract, among other things, the widespread propaganda in favour of curtailed slogans and of confining activity to the existing 'legality'" (LCW, vol. 17, p.468). The conference decided that the main election slogans for the coming Duma elections should be: a democratic republic; the eight-hour working day; and confiscation of all landed estates (LCW, vol.17, p. 468). The party which emerged from the January 1912 conference was officially known as the Russian Social-Democratic Labour Party. But because its political line was that which had come to be associated with the Bolshevik faction, and because its central leaders came from the Bolshevik faction, it was often referred to as the Bolshevik Party. In August 1912 there was a conference of groups and individuals who rejected the authority of the January 1912 conference. The August conference brought together liquidators, ultraleftists, Trotsky and others. This conference could not agree on anything except opposition to the Bolsheviks. The so-called "August bloc" soon fell apart. Trotsky, who played a leading role in convening the conference, was later to cite it as a classic example of an unprincipled combination. 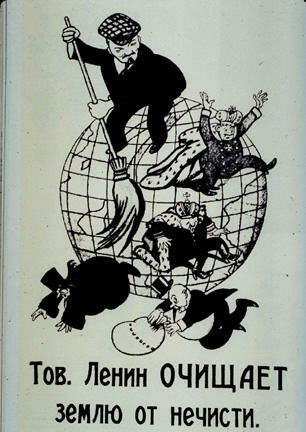 Following the January 1912 conference the Bolsheviks deepened their roots in the working class. They launched a daily paper (Pravda) in April 1912. The liquidators also launched a daily paper (called Luch). However Pravda had much more support from the working class. This was indicated by the fact that four times as many workers' groups made donations to Pravda as compared to Luch (LCW, vol. 21, p. 334). Mass working-class support for the Bolsheviks was also shown when they won six seats in the Duma from working-class electorates in the 1912 elections (LCW, vol. 18, p. 515). The real test for all groups claiming to be socialist came with the outbreak of the first world war. The Bolshevik Party (which was still officially known as the RSDLP) took a principled stand against the war. It called for "the conversion of the present imperialist war into a civil war" (LCW, vol. 21, p.34), i.e. for the workers in all countries to overthrow the governments which had led them to war. This actually happened in Russia in 1917, with first the February revolution, then the October revolution. The Mensheviks either became social chauvinists, supporting the Russian state in the war, or at best took a pacifist approach, opposing the war but being unable to organise a real struggle against it. The liquidators generally became social chauvinists. But Plekhanov, the former "pro-Party Menshevik", also became a social chauvinist. This was a sad outcome for one of the founders of Russian Marxism. Since 1903, he had vacillated between revolutionary and reformist politics. His failure to accept Lenin's invitation to help build a united party in 1912 was an important step in his degeneration. On the other hand, Trotsky moved in the opposite direction. Seeing the sellout by the Mensheviks, and the anti-war position of the Bolsheviks, Trotsky began to move closer to the Bolsheviks. During 1917 Trotsky and his supporters joined the Bolshevik Party. This fusion was based on agreement around the key political questions which had come to the fore in the new situation, including opposition to the imperialist war, opposition to the bourgeois provisional government, and the need for the soviets to seize power. The fight against liquidationism was crucial in building a revolutionary party in Russia. At the same time, the fight against ultraleftism was also very important, to prevent the party being cut off from the masses. These two inter-related struggles helped create the mass revolutionary party that was able to oppose the war and lead the revolution to victory in 1917.